ATTENTION: Finding it hard to focus? "Discover How To Eliminate Poor Time Use, Gain Focus And Become More Productive So You Can Get More Done..."
This Guide Will Show You How To Focus More So You Can Move Those Projects Forward And Get More Done In Life & Work! What is one of the biggest problems people have while trying to accomplish a goal? Everyone has the tools and resources to get the job done, but what they are lacking is FOCUS. Being the busy bee and the ever imaginative person that you are, it is quite impossible not to entertain a lot of thoughts about what you want to do and how you would want things done. Even ambition and the drive to be successful at everything can definitely keep you preoccupied and distracted from getting one thing finished. Although it is not entirely wrong to plan things ahead and to want several things to happen all at once, it wouldn’t hurt if you focus or stick to one plan at a time to avoid overlapping of goals or confusion. A lot of people fall victim to the belief that the more you accomplish in the shortest time possible, the more successful they become in their lives. Yes, this notion might work for some, but for those who are not that good at multi tasking, it is highly unlikely that they will reap positive results from this. If you are someone who seems to find multi tasking a challenge or maybe you would want to find a fool proof plan when it comes to planning and putting them into action, then focusing on one thing or task at a time would most probably help you out. What is focusing on one task and how could this really help you? Focusing on one plan or job means that there is an opportunity for a person to succeed in business or in any aspect of his life without multi tasking and scrambling to get things done right away. This also pertains to the practice of the “one task at a time” belief – thinking that as long as you focus on one thing that concerns the success of your business or any plan for that matter, you will have a higher chance of succeeding and of getting what you want. Veering away from multi tasking can definitely help you, especially when it comes to your online marketing business. You have to admit, you are willing to do or try anything just to keep your business afloat – this includes promotional or marketing strategies, getting more online customers or clients and of course advertising. And by that, it means that you might have thousands, if not, hundreds of ideas in mind that you would like to set in motion, without prior study or even analysis. And if you start considering and working on each of these ideas at the same time, you can bet a hundred bucks that 90 percent of your strategies are bound to fail. The benefits and reasons why you should focus on one thing at a time. Why you should start now before you get drowned in multiple tasks and projects. How multitasking can kill your productivity and eventually waste your time and effort. You'll be able to stop the poisonous routine of multitasking. The reasons why you're not moving forward. Top 30 ways to help you focus on one thing at a time so you can start seeing real results, today! Implement these techniques today. A simpler approach to improving your concentration. It's easier said than done, so this approach will help you focus. How to identify distractions and eliminate or avoid them so you can focus. How to stop multitasking and instead Focus On One. These techniques will help you adapt the power of focusing on one thing at a time. The Pomodoro Technique which will help you stop multitasking. How Can I Use This Powerful Guide Right Now? 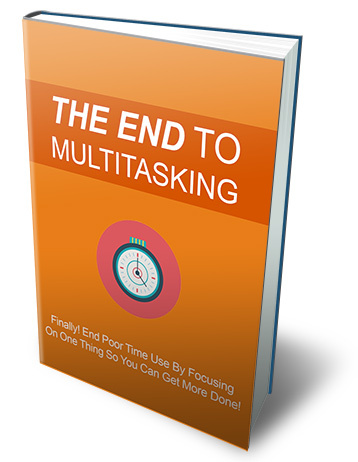 You can own The End To Multitasking today for a mere $7.00. That is a truly incredible value, especially considering the significant difference it'll make to your success. Did I mention this eBook is only $7.00? It’s definitely a point worth repeating. You will be hard-pressed to find a more valuable resource. Your purchase is absolutely risk free. Try the product for 30 days, and if you're not satisfied just send me an email and I'll send you a refund right away. So there's absolutely no risk on your part. All the risk is on me. I'm delighted to have the chance to share this powerful guide with you, and I know you’ll be very happy with the results. Again, you will receive the comprehensive and valuable insights you need to become successful for only $7.00. 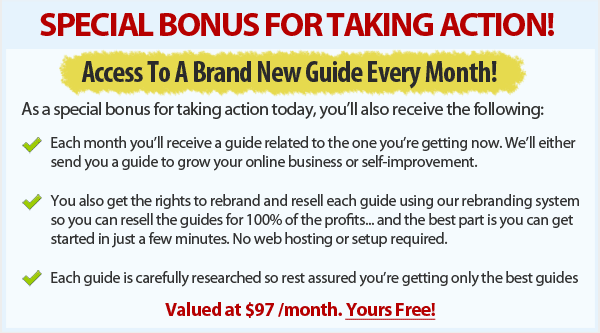 Please click the Add To Cart button right now and take ownership of this valuable eBook TODAY!